I’d like to challenge some of the training advice I see out there from “experienced” horseman about the retraining of ex-racehorses. First off let me introduce myself, I’m Raina Marie Paucar, a lifelong equestrian. I first started riding and showing on the hunter/jumper circuit as a child and I later went on to become a professional jockey. I’ve since retired and have over 20+ years of experience with racehorses. I’m a certified equine massage therapist, founder and writer of the popular Ex-Racehorse blog hosted on the Emmy-winning companion website of equitrekking.com and founder of ottbacademy.com. As someone who has professional experience with Thoroughbred racehorses from the foaling stall, to breaking two-year olds, galloping, riding in races and retraining for a new career after retirement–I see a lot of “expert” articles perpetuating myths and giving poor training advice about reschooling our beloved OTTBs (off-the-track-thoroughbreds). It is also my opinion that no beginner or intermediate horseman or rider should consider retraining an ex-racehorse coming straight off-the-track without someone experienced to guide them–as a matter of safety for horse and rider. Not to mention, ex-racehorses that have been poorly handled by an inexperienced but well intentioned person can ruin the horse’s chances of a successful future. I’ve seen far too many OTTBs written off and labelled “bad” and suffer terrible consequences through no fault of their own because of poor training. When you first consider the acquisition of an ex-racehorse you should learn everything you can about the horse’s background and physical history. This isn’t always easy or attainable information, but if you adopted the horse from a reputable organization, they can fill you in on all the details. Be sure to ask specific questions, such as: has this horse ever had past injuries, surgeries or behavioural issues that sidelined him/her from racing or training and what is the reason for retirement? If you want to know your horse’s racing history, find the previous trainers, owners, jockeys and races they competed in, equibase.com is a great resource. 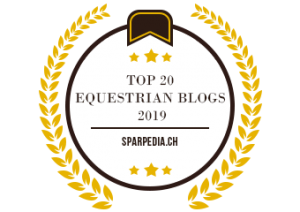 Once you know the history and any past or current injuries, treatments, surgeries, behavioural issues, vices under saddle, veterinarian reports and so on, you can start to formulate a training plan. Start by creating a planner with a calendar and outline your training goals. Mark the progress and make notes on your training sessions. From there you can make adjustments based on the horse’s response or performance. Getting in the habit of doing this gives you a training history and your results are measurable–this will help you get more specific on certain training goals. This is a huge key to successful OTTB training. In my 20+ years of experience in rehabilitating, reschooling and rehoming ex-racehorses, I believe strongly that it’s best to start with groundwork. The musculature structure of the racehorse needs to be redeveloped and reshaped for the newly intended discipline–and that takes time. Another consideration is though many are quick to adapt, OTTBs may also need time to mentally adjust to both the new training techniques and environment. This is especially important if they haven’t had time on the farm or had turnout and all they’ve ever know was racetrack life. And even though racehorses have “seen it all” on the racetrack, I also do a series of bomb proofing or desensitizing exercises. If the horse is physically sound and the vet has approved the horse to begin training, I start building the horse using core exercises to activate and develop the deep muscles to help achieve symmetry, balance and straightness. With all my equines, I like to implement stretches and massage therapy. I treat the superficial muscles to increase range of motion, aid in pain alleviation, reduce muscle tension and increase flexibility. It’s also worth mentioning that regular massage therapy sessions and stretches can help address some behavioural issues that stem from unaddressed physical pain. After your initial test ride to determine if you are a fit for the horse or if you are retraining and selling, consider starting from the ground first. You can do with this by lunging, using long-lines and in hand work. If you want to establish trust, have successful experiences and a bright future full of possibility with your equine partner–listen to the horse–start with a plan and work from the ground up. To learn more about how you can develop your horse and achieve peak performance by implementing a systematic and holistic approach to training, check out ottbacademy.com. Follow OTTB ACADEMY on Facebook + Instagram.